This mod simply adds new arrows that you can use. These new arrows can all be used with the vanilla bow and should also be valid for modded bows too! Have a new arrow idea? Let me know in the comments! No guarantee I will make it add it. Is there a way to make skeleton shoot these arrows? Looking at the code for skeletons, if you spawn them with the item in their offhand slot it should shoot that arrow instead. However Mojang seems to have hardcoded this to use spectral and tipped arrows and none of the other types. So it's not currently possible although it's something I may look into doing. This mod adds new items, so if the server has it installed clients connecting will need it. If the client has it and the server doesn't, you wont be able to craft the arrows. This is how virtually all mods which add items act. Weakly guided to the nearest hostile mob. Still affected by gravity and prioritizes targets in its path. Crafted same as flint arrow but using popped Chorus fruit instead of flint. Creates a small, terrain friendly explosion, sending out 8 normal arrows out diagonally upwards in a ring that have base damage of 2. Crafted same as flint arrow but using pufferfish instead of flint. Upon hitting a block, it makes an small, terrain friendly explosion that bounces the arrow in a new direction, bouncing 3 times maximum. Crafted same as flint arrow but with slimeball instead of flint. Upon hitting a block or entity, summons 3 ghast fireballs to bombard the location hit. Crafted same as flint arrow but with Nether Star instead of flint. Three small explosions weaker than TNT seems like a mid game weapon, not really powerful enough to justify killing a boss every time you want one. I would suggest something more like a craft an arrow but the top center and the center left and right slots are are fire charges. Requiring blazes seems right. That or using ghast tears in a normal arrow pattern. What is the recipe for the arrows? Can people disable or alter the base damage of the arrows, including the vanilla one? Sorry for the late reply, you can modify the arrows added by this mod, but not the vanilla one. The flint arrow in this mod is meant to be a replacement for the vanilla arrow, and you can use mods like CraftTweaker to replace them. I finally got to test the mod out, but I can't seem to find how to change the arrows's damage. Shouldn't there be a config file? I like the idea of the obsidian arrow, it would be like infinity, but you have to go get the arrow again, I would love to see something like this in vanilla. Since no one is posting ideas I guess i'll give you some more ideas. Golden carrot arrow, it has a base damage of 1. When the arrow strikes a block or mob, it aggros all mobs in a 16x16 radius to said block/mob. Crafted the same as flint arrow but but golden carrot instead of flint. Firework arrow. It has a base damage of 4 creates a small explosion on hit and they do not arc, they always fly straight. Crafted with a firework and stick. They leave a firework particle trail when flying. You should add water arrows, that put out fires, turn lava into obsidian, water crops, break torches, and deal 20 hearts of damage to nether mobs and enderman. Otherwise they deal no damage. They are crafted with sticks and water bottles. 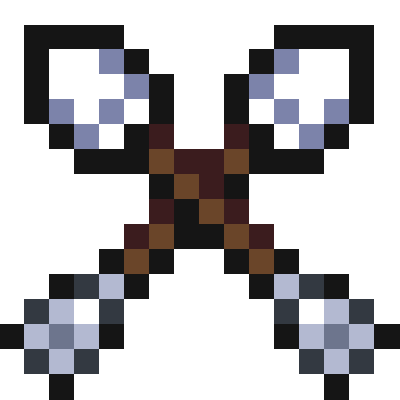 Another idea are oil arrows, they deal no damage, but they have two effects if they strike lava,fire,torches or any mob on fire, it will result in an explosion, dealing huge amounts of damage killing iron golems in a single hit. Second if they strike any entity not on fire, they they apply a "oil" effect on that entity for 50 seconds. Any mob with "oil" effect will explode if they are set on fire. the explosion will deal 50 hearts and is small. I was actually thinking about a water arrow the other day, since my SO has a habit of accidentally burning everything down on our servers lol Thanks for the ideas.